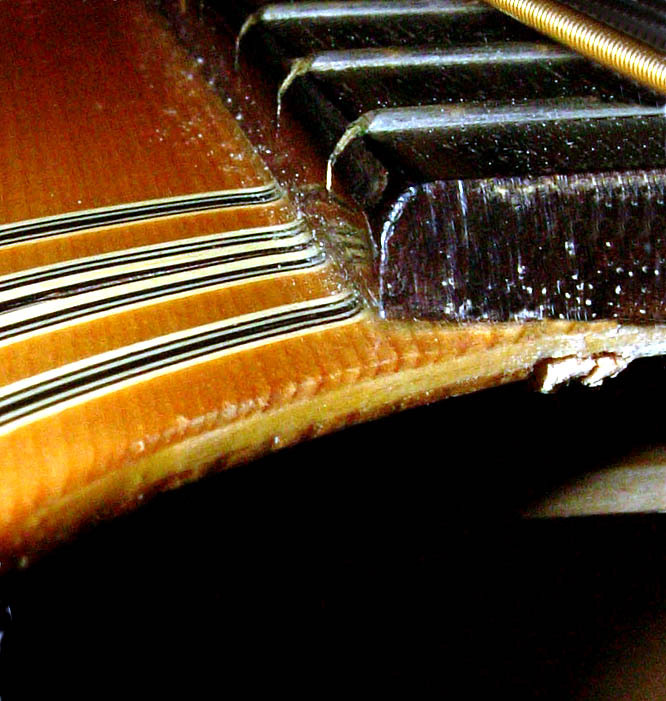 Close up of a laminated guitar top. 1 By 'acoustic,' I mean those that produce their sound by their own internal vibrations. What I called steel-string guitars above are sometimes just called 'acoustic' guitars. Neither name is associated with a distinguishing characteristic (only classical/flamenco guitars do not have steel strings, and only electrics and steel guitars are not (primarily) acoustic.  The first two varieties of acoustic1 guitars (classical and steel-string) have enough things in common to justify some combined comments. There are two primary features that tell you that you are looking at a lower quality instrument. These are laminated tops (read 'plywood') and poor bracing patterns. The first is easy to find, and should be explicitly stated in the instrument description (if you are buying second-hand, look the model up on-line). The picture at the right from lutherie.net (recommended) is a clear example (although slightly damaged). Note the layers in the top wood. If you are seriously strapped for cash, a guitar made like this can still be passable, and they do tend to be a little more durable, but at the expense of tone, especially in the long-run. So look for solid wood if possible. These days it doesn't cost that much more. 2 You will probably notice a joint in the wood at the center. The best tops are sliced down the middle and then glued together at the point of narrowest grain. This is called 'bookmatching.' You will see the same thing in quality violins and other fine stringed instruments. Once you have determined that it is solid, there are still visible quality differences. Decorative grains look nice, but lose the sound. What you want is really pretty boring looking (unless you become a luthier [stringed instrument builder], in which case your taste in beauty undergoes a metamorphosis). Here is an example of quality top wood. You will notice that the grain is straight up and down, with as little waviness as possible (some is OK). This means it is quarter-sawn, which is a more wasteful way to cut wood, so it is more expensive. The closer the grain at the center of the guitar, the better.2 It should also be made of some coniferous soft wood; spruce is most common, but pine, cedar, and even redwood can make fine tops). In the picture, you might see a sideways grain-like texture. This is not the grain; it is called 'silking,' and means that in addition to being quarter-sawn, it was cut slightly on the bias. Very tight center grain and some silking are the marks of a very high-quality piece of top wood. 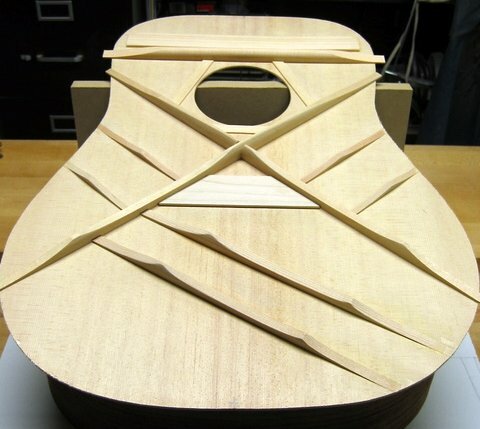 Do not worry that the grain is slightly more open at the outer sides of the guitar. The less this is true, the better, but you will always see some of that. Quality of top wood is also a function of age. Unfortunately, you may really have to dig to find out how much a manufacturer ages their wood before putting in guitars. There is no visual indication I am aware of. If you are buying second hand, of course, the wood is at least as old as the guitar. When older guitars still play well, this is a major selling point. By the way, if your top is laminated, it doesn't make much difference whether the veneer used for the top surface looks like quality wood. The laminate image above has such a 'quality' veneer. If you are going for laminate, you might as well go for the pretty stuff. You can expect to pay good money for a quality top, but any piece of quarter-sawn solid spruce will end up sounding better than any plywood top. Guarantee. And I have heard some very sweet sounding guitars with fairly coarse grain (although still straight and quarter-sawn). I am told that even Stradivarius violins didn't always follow these guidelines exactly (except he never used plywood). 3 You will notice I decided to go for the sexist language here. I can do that because I am a guy ☺. 4 This is not just about size. I have found the Taylor 'parlor size' guitar, for example, to have a quite acceptable sound. There are manufacturers that don't even use wood. Some sales-guy3 may tell you that 'studies have shown' that it is just a good, maybe better. This may be true if you define 'good' as the same as 'loud.' I don't. However, the truth is that carbon fiber tops don't necessarily sound bad. Rainsong's Jumbo offering (pictured) has nice resonance and an overall good sound. I still like wood better, but I would not be at all ashamed to own one of these. Their "shorty," on the other hand sounds shallow and distinctly lacks what I regard as tone quality.4 I would have to say the same for carbon fiber violins and cellos I have heard. Tone quality or not, however, they are clearly more durable, and they sound good plugged in. If you travel a lot, and take your instrument, consider one of these for the road, while you leave your really good one at home. Classical guitar by Ethan Deutsch. Steel-string from The Craftsman's Path. 5 On acoustics, that is. The first electric was plywood back in the 1930s. Plywood acoustics picked up real market share when the Japanese started exporting a lot of guitars to the US. This was not because they did not make nice guitars—I remember playing a wonderful sounding solid-wood Yamaha back around 1975—but laminate enabled them to make the trans-pacific voyage without falling apart. Of course such instruments were, and still are, cheaper. 6 Some tune the top to a note, and the back to another. Some simply look for resonance all over but with no particular note in mind. Violins often have the bridges and tailpieces tuned in addition to the instrument. There is so much variation that some skilled luthiers argue that none of this if of any value at all. Perhaps the builders that take the time to tune the instruments are also not cutting corners elsewhere, and it is that, not the tuning, that makes the instruments sound better. Whatever the reason, if you want superlative quality, you usually have to pay for it. 7 Although I think I actually saw someone doing this at the Guild factory once. I can't be sure-I was eighteen and didn't really know a lot about guitar building at the time. 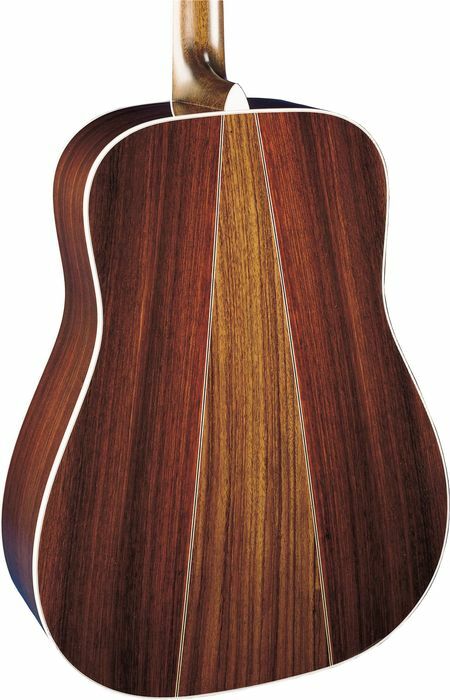 8 Martin makes a guitar that is solid mahogany, including the top. It was doubtless introduced as a low end option, but has proved quite popular with acoustic blues players. Mahogany is a softer wood, even though it is classified as a hardwood. The same comments I made about coniferous woods (straight grain, quarter-sawn, etc.) doubtless applies to mahogany as a top-wood as well. The classical pattern was developed by Antonio de Torres in the 19th century. 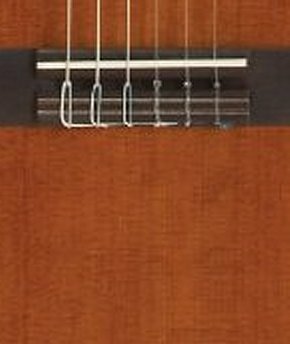 The steel-string pattern was developed at Martin Guitars in the 20th. 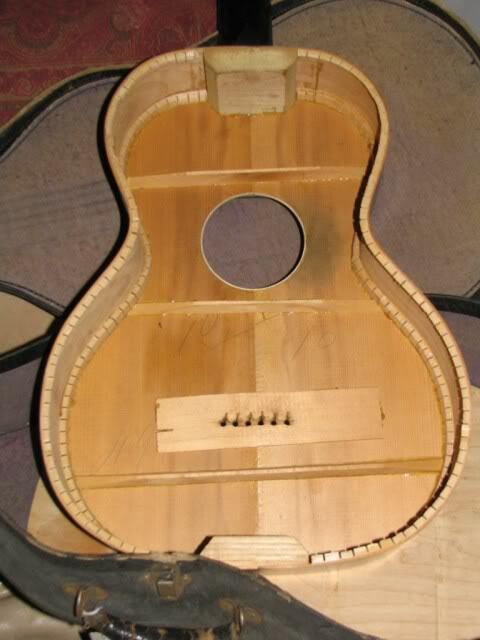 Some newer instruments are being made with the sound-hole off to the side on the upper bout. There is a good argument for this, but the bracing pattern that makes it sing may take a while to find (although see my thoughts on acoustic basses). Older cheap ladder bracing style. Without taking the guitar apart, I popped the braces out and designed a special clamp that allowed me to put new ones in without taking it apart (made out of the old ones, for the most part) following the Martin pattern. People who played it couldn't believe that it used to be a Harmony. It didn't hurt that the guitar was probably close to 25 years old before I started. Actually, now-days, you will be hard-pressed to find a guitar made with this cheap bracing pattern (which is a good thing), and it is going to be a challenge to figure out if you have found one (salespeople don't like you loosening the strings and sticking your hand inside to feel around-although you can use a dentist style mirror). If you are shopping at the low end, or second hand, though, I make no guarantees. Back from a Martin D-35. I've spent all this space talking about the top. The back and sides are much less important. They should be a hardwood, and virtually always are. Even laminated is OK for the back and sides (although you only sometimes see solid top without solid back and sides). I have replaced the tops on a couple of laminate guitars with solid wood and ended up with nice instruments. Of course, they still weren't valuable guitars, but they sounded good. Ovation, of course, has a niche in artificial backs, and sometimes tops. I have already expressed my opinion on the inorganic tops, but I have heard decent sounding offerings from this company as long as they have solid wood tops, properly grained and braced. I have encountered intonation issues with some of the lower models, but that is another matter. Still, having a resonant wood has it advantages. But when I say, "they should be hardwood," I am talking about brittle-hard. This is because its primary offering to the guitar sound is its reflective quality. In spite of this, they are sometimes made with mahogany. I suspect this is a money-saving option from the point of view of the manufacturers. It is also very easy to work with, and doubtless bends easily. As far as I can think of, those are its advantages.8 In the days before it became a protected species, the wood of choice was Brazilian rosewood. The East Indian variety is still available, and the difference as far as the quality is entirely in snob appeal. Maple is a frequent choice. It seems to give the guitar a brighter feel, although how much of that is just psychological, since it is also a lighter wood, I don't know. You are beginning to see a lot of experimentation in this field, with the greatest emphasis on appearance.